The photoacclimation capacity of the seagrass Cymodocea nodosa was evaluated considering temporal (i.e. seasonal) and spatial (i.e. depth and within-leaf position) factors of variation. Changes along the leaf were measured in a population growing along a depth gradient (from intertidal to subtidal) in Cadiz Bay (Southern Spain) from 2004 to 2005. Photoacclimation was evaluated by photosynthesis (P–E curves), pigment content and leaf morphology. Plants of Cymodocea nodosa showed large physiological and morphological plasticity (mean %CV = 35.8 ± 3.4) according to the three factors considered. Seasonal patterns appeared for photosynthesis, respiration, pigment content and morphology. Nevertheless, seasonal patterns were not consistent with depth or leaf portions. The resulting data set offered different information depending on the analysis conducted; when only one factor (season, depth or leaf portion) was considered, some tendencies observed in the 3-way full design were masked. 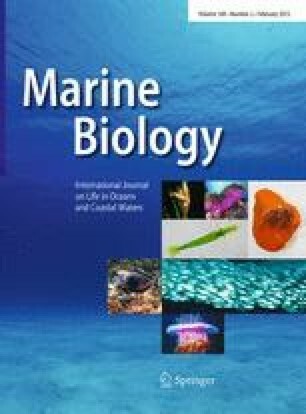 Accordingly, considering spatio–temporal variability is crucial when describing photoacclimation and estimating productivity in seagrass meadows. The financial support through the research projects CTM2005-00395/MAR and CTM2008-0012/MAR from the Ministry of Science and Innovation of Spain is thankful. Authors thank Dr. G. Peralta and Dr. E.P. Morris for their help with in situ data. I. Olivé holds a postdoctoral grant from the Portuguese Foundation for Science and Technology. This is CEIMAR journal publication no. 16.